I've sat in on hundreds of technically-themed presentations over the years and the vast majority of them taxed my attention span. I suspect I'm not alone. That's a shame since, with few exceptions, these presentations were intended to achieve something important: To persuade, to inform, to impress--or not. There are myriad reasons why presentations fail. A common one is what might be called a "flat" structure and delivery. In flat presentations, all content is essentially treated as equivalent in importance and interest. It's a bit like watching a movie about two men conversing around the dinner table. There may be a few who find it intellectually stimulating (witness the positive reviews for the movie My Dinner with Andre), but most of us need some dramatic peaks to hold our attention. Thus my advice to add "contours" to your presentations. This involves saying or doing something to draw people's attention back to what you have to say. 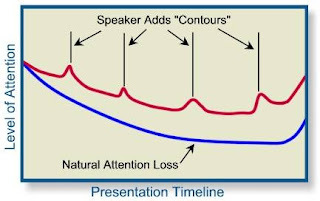 Perhaps you've never considered the natural tendency of an audience to lose attentiveness over the course of your presentation (as illustrated in the chart below). But it's a real problem, especially with flat presentations. Adding contours helps ensure that people are actually listening when you deliver your key messages. Give your presentation an definable structure. Consider this outline: (1) Call to Attention--opening comments designed to grab audience attention at its peak and answer the question everyone is subconsciously asking: "What's in this for me? "; (2) Key Messages--3-5 important points you want to make, with each serving as a transition (contour) point in your presentation; (3) Call to Action--a summary of the high points of your talk, with a requested response (approval, decision, selection, next steps, etc.). A presentation without a definable structure is akin to a book without chapters. Ask questions. Engaging your audience in some conversation is one of the best ways to keep them attentive. I usually mix questions where I actually expect a response with questions designed primarily to get the audience thinking. The latter often provoke spontaneous comments and questions from audience members. Refer to audience members by name. This takes asking questions to the next level: "Bill, what is the greatest challenge your firm faces in preparing for shortlist presentations?" No one wants to be embarrassed by being asked a question when they aren't paying attention. But if you're reluctant to put people on the spot this way, you can still use audience member names to increase attentiveness: "Now imagine I'm making my initial sales call to Jenny here..."
Demonstrate something. Doing something is always more compelling than talking about doing something. It also can make things much easier to understand. It's even better if you engage the audience in doing something. 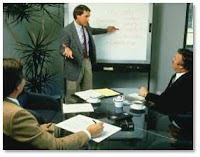 So for example, you could ask for a couple audience members to help you act out a role play (which you prepared in advance) to demonstrate the techniques you're trying to teach on how to deal with difficult employees. Tell a story. Stories can bring otherwise dry topics to life. That's why case histories are popular. But don't miss this critical point: Stories work because they connect with our experiences, interests, and aspirations--in other words, our humanness. Technical professionals often misuse case histories by focusing on technical features rather than the human dimensions of the story. The best stories engage people at the emotional level. Insert a few compelling pictures or graphics. Visual images generally have more impact than words. Some images stay with us long after the presentation is over. Always consider how you might capture your most important messages visually. A good image or graphic immediately gets your attention, even before it is explained. Share something that's surprising or provocative. Technical professionals are prone to be conservative in their presentations, avoiding anything that might invite skepticism or disagreement. But that's also the recipe for boring. I always try to challenge conventional wisdom at strategic points (contours) when I speak, present facts that some will find surprising, or at least suggest something that most in the audience have probably never thought about before. Having something to say that's different is an effective way to keep people interested. There are a few other techniques I could mention, but you get the point. Don't assume that you'll have your audience's attention throughout. Instead determine at what points in your presentation it will be most important for them to be fully tuned in. Then add contours to increase attentiveness at those points. Doing this can help you avoid falling flat in your next important presentation.